A Crown Fam & Loki MGMT collaborative effort, this is a BRAND NEW video from Shugga Shane featuring Quicc & A2i rep CALIKIDD. The first single from his upcoming “L.A. Kings” project, this track is guaranteed to get any place active! Watch our young rappers turn up at a private party in Long Beach while lacing the track with fire. The trio spits a barrage of braggadocious lyrics delivered with cadence. Produced by the super-producer; SuperStar O, “Hands On Your Knees” is a definite banger and needs to be in every DJ’s crate! 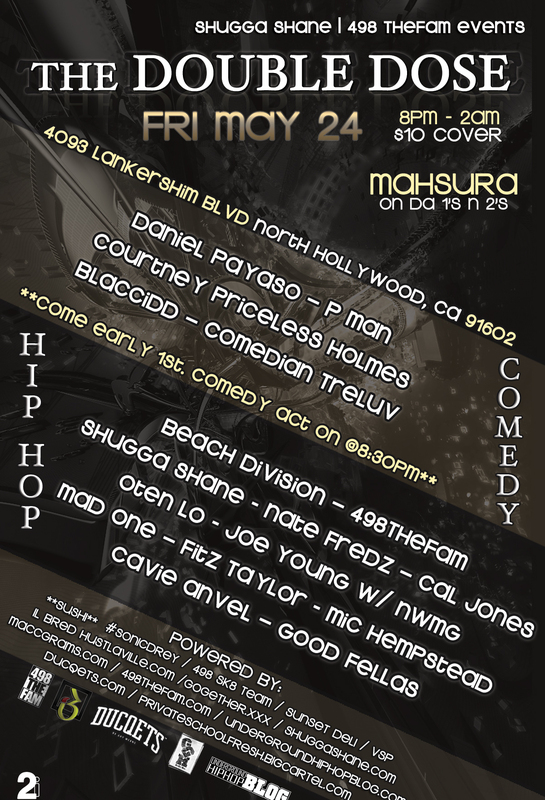 Catch Shugga Shane + more LIVE in North Hollywood! Dope music, Cold drinks, Great food & Good times all night long! Crown Fam Records & Crucial Visions Media Group team up to bring you brand new visuals from West Coast hot-spitter Shugga Shane!! This video brings Shane’s street anthem, “Can’t Stop Now” to life! Filmed through out Los Angeles, this video depicts the gritty life-style of a young hustler trying to make it on his own. The track was composed by mid-west producer D. Truman and is from Shugga Shane’s acclaimed “Ears To The Steets” mixtape which was hosted by DJ Mustard & DJ Noize. This is the last music video from that mixtape as Shane is wrapping up his forth-coming project, the “L.A. King$” album. Make sure you LIKE, Comment & Share the video! Thank you for the continued support. 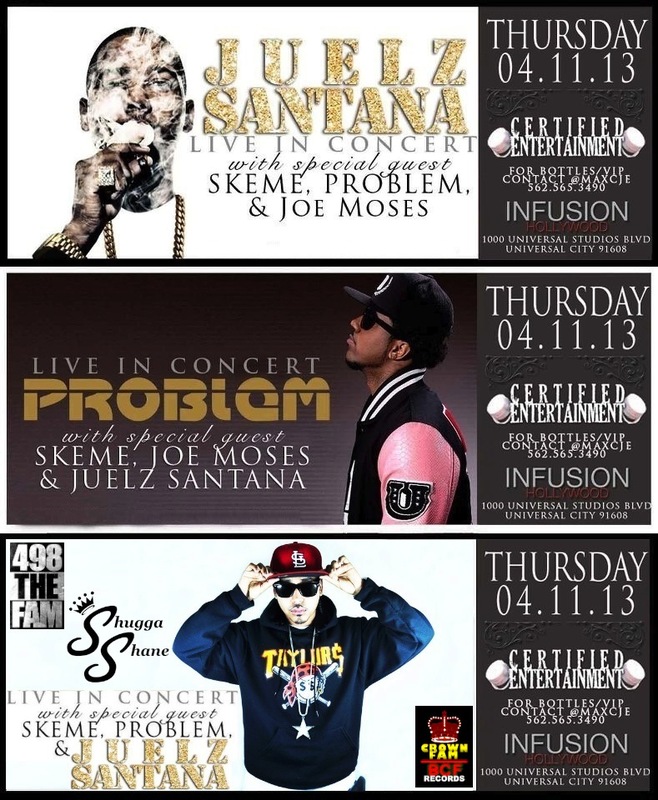 Get your Tickets (CLICK BUY NOW BUTTON ABOVE) for JUELZ SANTANA, PROBLEM, JOE MOSES, SKEME, SHUGGA SHANE & 498 THE FAM LIVE IN CONCERT SAT, APRIL 11TH at INFUSION LOUNGE on Universal Citywalk. First come first serve. This will be a SOLD OUT, star studded event because Juelz Santana has not performed in Los Angeles in over YEARS! Do not miss it! 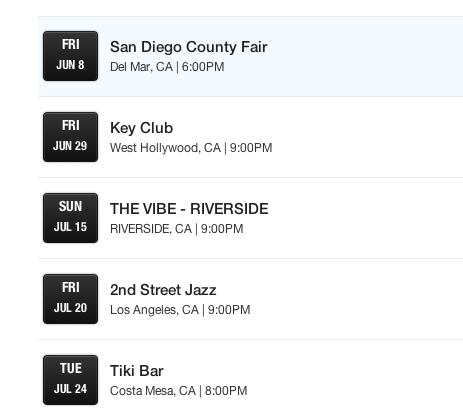 Get your tickets NOW by clicking the “BUY NOW” button above and avoid paying more later! Will be mailed out immediately or are available for pick up! 21 & Up w/ ID. “Go Go Go” is now on iTunes! Shugga Shane & Quicc drop tantalizing verses on this banger, which is composed by U.K. producer Yung FLO. Definitely a track that will get the party going any where. One of the fan favorites off of Shugga Shane’s revered “Ears To The Streets” mixtape. A MUST HAVE for DJ’s all across the globe! Tell your favorite DJ about this track! #JamResponsibly. Shugga Shane & Crown Fam Records are back with some FRESH & nostalgic visuals to his fan favorite single “Ears To The Streets” ! This video takes us back through memory lane and has actual video footage of SS recording the song back in 2010 as well as brand new scenes after his release. This is the title track off of Shane’s last mixtape which was hosted by DJ Mustard & DJ Noize and has received lots of notoriety. Shugga spits dope lyrics laced with swagged out flows over this smooth beat produced by ID Labs so this track is definitely a jam. Play it, Share it, LIKE it.